I have been a huge fan of the author’s Facebook page, Baby Sideburns, for about a year now. I had to get the book.. When your son wakes you up at 3:00 A.M. because he wants to watch Caillou, he’s an a-hole. When your daughter outlines every corner of your living room with a purple crayon, she’s an a-hole. When your rug rats purposely decorate the kitchen ceiling with their smoothies, they’re a-holes. So it’s only natural to want to kill them sometimes. Of course you can’t because you’d go to prison, and then you’d really never get to poop alone again. Plus, there’s that whole loving them more than anything in the whole world thing. Karen Alpert is the writer of the popular blog Baby Sideburns. You may have seen some of her more viral posts like “Ten Things I Really F’ing Want for Mother’s Day,” “Daddy Sticker Chart” and “What NOT to F’ing Buy My Kids this Holiday.” Or you may know her from her Facebook page that has over 130,000 followers. 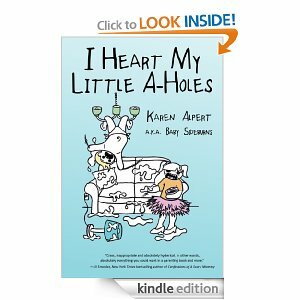 I Heart My Little A-Holes is full of hilarious stories, lists, thoughts and pictures that will make you laugh so hard you’ll wish you were wearing a diaper. I have one six year old daughter. ONE. If we ever have another, she can probably help me care for it. I have no clue how parents deal with two kids in diapers at the same time (Hi Beth and Aimee!). This book reminded me of the crazy things my child does on a daily basis. Even though she is out of the “I will destroy everything” phase, she is still pretty hilarious. But nothing compares the the stories in this book. I am so glad I read it when my husband was on night shift, or else I would have been waking him up every few minutes laughing hysterically. Or from peeing the bed. I especially loved her thoughts on Caillou. I still hate Caillou. I do understand that some people have difficulty referring to their kids as a-holes. It doesn’t bother me. Because This past week, my daughter has woken up before dawn EVERY MORNING (eff you daylight savings). She regularly hides food in her room and creates “science experiments”. I won’t even mention the hell that I go through trying to brush her hair in the morning. I worry about the parents that don’t acknowledge that parenting isn’t all rainbows and unicorns. They are delusional. Overall, a hilarious read that all parents can definitely relate to. Through a series of fortunate events for me (thanks to EBW), I am indirectly getting some exposure for Girl of 1000 Wonders and getting some new books. Linda Harley, author of the 99¢ novella series Nuelda, and the first book in her second series, Destiny’s Flower, contacted us through the Book Reviewer Yellow Pages. I got an email, read the synopsis and snagged her book right up to review. And then, another fortunate thing happened: she offered to give an interview to go along with my review of her book! At first I wasn’t sure if I’d taker her up on it, but then I remembered this post I made on the G1000W Facebook page back in April, so it was time for me to buck up and put on my serious book blogger face and come up with some questions….which is where I faltered for a while. What do you ask an author? What would people want to know? So I dug around some on Linda’s website, Rosebuz, for a jumping off point. Without further adieu, here is my interview with Linda. You have a very interesting background. 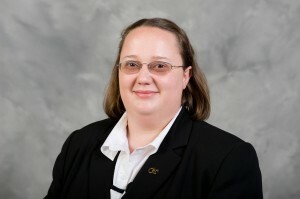 You were born in Durban, South Africa and received a BS and MS in Civil Engineering from the Georgia Institute of Technology, in 2002 and 2004, and received your PhD in Applied Physiology from the Georgia Institute of Technology in 2011. What did your growing up years look like? Where do you call home? I lived 20 minutes from the beach growing up in Durban, South Africa. Most weekends were spent at the beach hanging out with friends and family. From my high school classroom windows we actually looked out over the harbour and the ocean, and it was always a comfort. Durban has a very tropical climate, in that we only had a dry season and a rainy season. It was green year round, and I never really knew that there were different seasons until I moved to the US at the age of 19. Although I have family back in South Africa, I do call Atlanta, Georgia my home as some of my family is here as well. You graduated with science degrees, and have published numerous articles and papers, as well as being a contributor to a few books. How do you find time to continue your work revolving around complex bilateral tasks and new technologies for rehabilitation AND pursuing fictional writing? Typically when I get home at night, I spend some time with my family, watch TV and play online games. But every night before I go to bed, the last thing I do is take about 30 minutes to an hour to work on my latest story. My goal is to usually write at least 1 page a night, whether its good writing or not. I write with pen and paper, simply because if I wrote on the computer I would be to tempted to surf the internet, check Facebook and email and get easily distracted. When the draft is completed by my nightly endeavors, I usually take a long weekend (3-4 days) to sit and do nothing but edit the story. This beta version is sent out to beta readers, and then it’s a process of refinement and fine tuning. Making sure I tie everything together and that the pace and story line is appropriate. How did RoseBuz, your blog/website, come about? It’s quite impressive, mixing science with book reviews. You have guest writers and get thousands of hits in just days. How do you make it work? RoseBuz came into existence because I wanted a chance to share my stories with the world and have a place where people could come to learn about how science and the arts really can work in unison and don’t have to be in opposition. 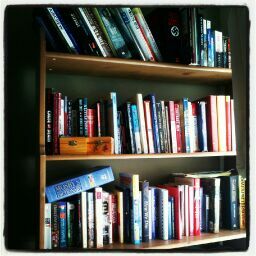 I love reading books, and typically read at least 40 books a year and listen to about 40 books on my iPad a year. Being a new author, I learned that it is great to have folks review your book, and so thought that I would give back to the community by blogging about my thoughts on books. I do it all free of charge, but this means my to be read pile currently stretches into 2015. When I first started this blog, I never imagined that it would be such a huge success. I get approximately 30 requests for review per week, and there’s no way that I could read all these wonderful stories. So, a little plug here, if anyone is interested in reviewing books, but don’t know where to start, feel free to drop me a line at rosebuzlrh@gmail.com. (See the question below regarding the reviewer process.) I’m currently looking for reviewers to blog on Rosebuz. Since I’m pretty organized, I update the site about once a week, and this is typically what I do on Saturday mornings. Actually it’s not hard to write two series at the same time. Saldiora (Destiny’s Flower) is my main focus and so I spend the majority of my time working on it. However, every now and then I need to take a mental break from Saldiora, and so I focus on Nuelda. This usually occurs after the Saldiora Beta version is sent out to beta readers, and I have time to devote to Nuelda. 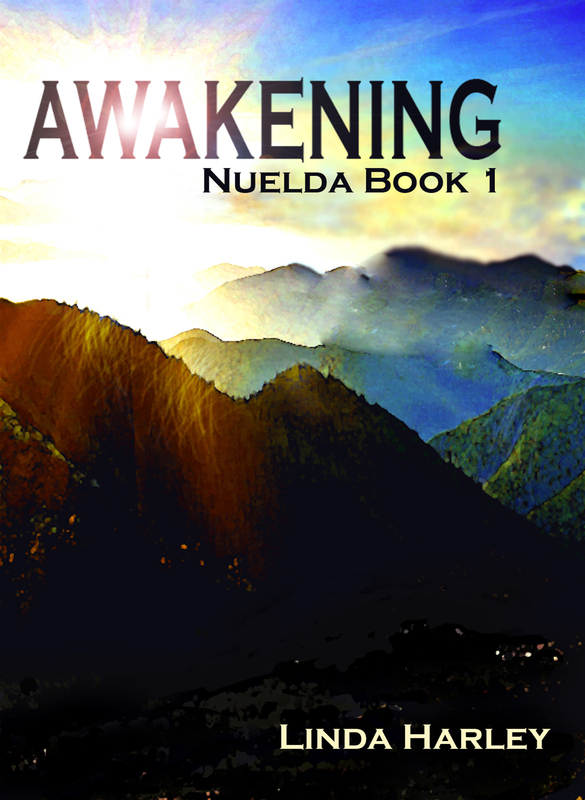 Nuelda is intended to be a free short novella set of stories, that will be posted on my website for anyone in the world to enjoy. Although not apparent yet, (wink) they actually play of in the same universe just decades apart. How long has Rosebuz been going? I started to create the site in July 2011, but it took a few months to set it up and get it exactly the way I wanted. I did not start to actively use it or post to it until January 2012. So I’d say it’s been going actively for about 1.5 years. How did Rosebuz evolve from your personal reviews to what it’s grown into today, with two site reviewers and multiple guest reviewers? Do you attribute the massive numbers of page hits to this evolution? I’m a researcher by heart, and therefore I typically don’t do anything in life without investigating time up front to understand what I’m getting myself into. The same can be said about the website. I spent a few months reading books on successfully marketing and creating your own personal brand. I learned that having a clear brand goes a long way towards marketing and getting people interested in what you do. The resource that helped me most was Dollars & Sense: The Definitive Guide to Self-Publishing. It guided me and helped me to define what I wanted my personal brand to be. I love science, and I want to encourage young people to become scientists and engineers and doctors. Because of my passion, I decided that the best brand for me would be to combine my love of science fiction/fantasy writing with my love of real science and engineering. Once I had this defined, it was relatively easy to create the site, since the brand dictated what information would and would not be on the site. I found that I was reading a lot of novels and wanted to keep track of all these excellent books, and so I incorporated that book review aspect and listed myself on the IndieReview and the Book Reviewer Yellow Pages. Since then I’ve had many authors drop me notes, requesting to participate in the website, and it took off from there. Rosebuz must be the only place where it is published. I hope to continue to grow Rosebuz. Could you explain the process for potential reviewers? Sure! Right now the process is pretty easy. All they need to do is send me an email at rosebuzlrh@gmail.com with an example of a book that they have reviewed. They should probably read the review policy on Rosebuz.com first, in order to understand how we operate. I have a zero tolerance for erotica or foul language, and thus will not have reviewers who review those type of books. Rosebuz is a family-friendly site and I want it to remain that way. Once I’ve reviewed their sample, and I think their a good fit they will be invited to join. After that, it’s a matter of getting their info up on the site, and get them going. 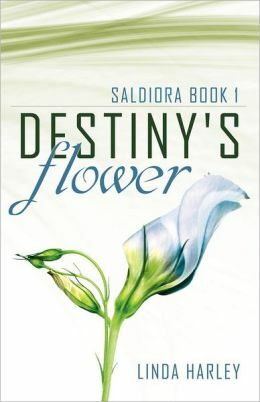 How many books do you expect to be in the Saldiora book series (Destiny’s Flower)? I have planned three books of the Saldiora book series, with Lynn Davis as the main character. Eventually there may be some off-shoots from that as some of the other characters are screaming at me, telling me they want their stories to be told as well, and they don’t like me playing favorites with Lynn. (sigh) They’re so demanding. Currently I’ve appeased them by weaving their stories into Lynn’s where appropriate. How did you become interested in fictional writing? It seems so different from the professional writing seen in your publications. I’ve always loved stories. When I was a kid (still to this today) I would tell myself silly stories when I had to go to bed. My mom is often fond of telling the story of when she would put me down for my afternoon naps and I would wake up and not disturb her, but just sit in my bed playing with my fingers telling myself marvelous stories and entertaining myself. I love to tell stories and read them, and I love science and fantasy. So I think it’s a great combination! Do you have upcoming plans for any other books, outside of the two series you’ve already started? I have so many ideas for non-fiction and fiction books. If it was up to me, I’d spend my entire days doing nothing but writing. Unfortunately though, I’m still a novice I can’t afford to quit my day job. But it’s a dream of mine to be able to tell all the stories I have floating around in my head. When can we expect Book 2 of Saldiora? And Nuelda? The plan right now is to have Saldiora Book 2 come out around Christmas, with Nuelda Book 2 coming out in the spring of 2014. What suggestions do you have for authors-in-the-making? How can they get started with an indie publication, such as Smashwords? First and foremost, make sure that you have a solid manuscript. If you’ve never written a novel before, consider attending a workshop to at least learn the basics. Trust me – it will save you a lot of headache if you do. The teacher of the workshop I attended was Michael A Stackpole. His training material is available for purchase online. It is worth going through those exercises. The funniest thing though is that Michael kept saying that you ever only need to do one workshop, because after that you just have to learn by doing. I can attest to that. My first draft of Saldiora had violated so many basic rules, that I had to redo the entire draft. The second book in the Saldiora series is going much smoother, since I’ve learned a ton of what not to do and what to do. In my opinion, too many new indie authors rely on only publishing their work in eBook format. Yes that is the cheapest way to publish, but in the end you’re only reaching about 30% of your potential customers. I would strongly recommend you spend some time considering whether or not to publish in print. I spent about 6 months investigating and considering my options with regards to publishing. Whether to go with a traditional publisher or self-publish. I read all the contracts and tried to make sense of it. I even hired a lawyer to help me understand all the legal terms. In the end, it came down to personal preference, in that what was I willing to sign away. Most traditional publishers want you to sign away all of your rights, do your own publicizing, and they sit back and reap the benefits of your hard work simply because they’re printing the book. I did not want that to be me, and so settled on self-publishing. I had a few good offers from publishing companies, but in the end decided it was not for me. If you’re considering what route to go with self-publishing, I really recommend you read The Fine Print of Self-Publishing by Mark Levine. He’s already done all the leg work for us, and you can easily find a self-publishing company that fits your needs and your budget. Keep up with Linda on Facebook. Be on the lookout for an interview with Linda in the coming days. Again, if you are a reviewer, go check out her site and see if you can get on-board.